It’s very easy to add tawk.to to your WordPress site! Login to WordPress admin and navigate to the Plugins menu. It’s on the left side of the WordPress dashboard. Then Select Add New. Select Tawk.to Live Chat by Tawkto from the results and click the Install Now button. You are now in a list of installed plugins. Find the Tawk.to Live Chat plugin in the list of plugins and click on Settings. 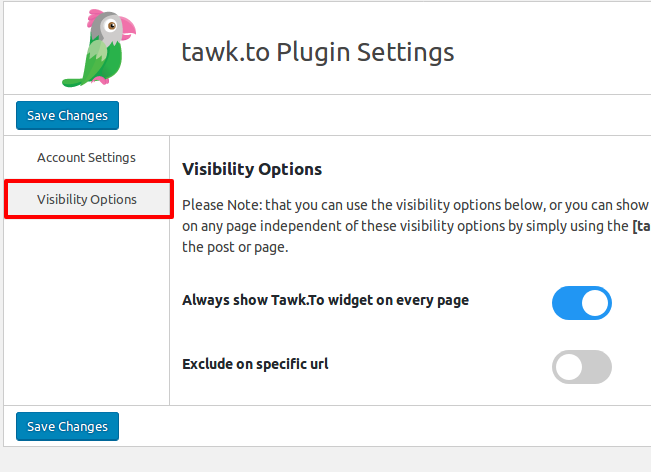 NOTE: you could also access this page by selecting settings->tawk.to from your dashboard menu. Congratulations! You’re done. The Widget will now appear on all pages of your WordPress site! You can control widgets visibility on your site using the Visibility Options menu.By default, the Widget will display on every page on your wordpress website. 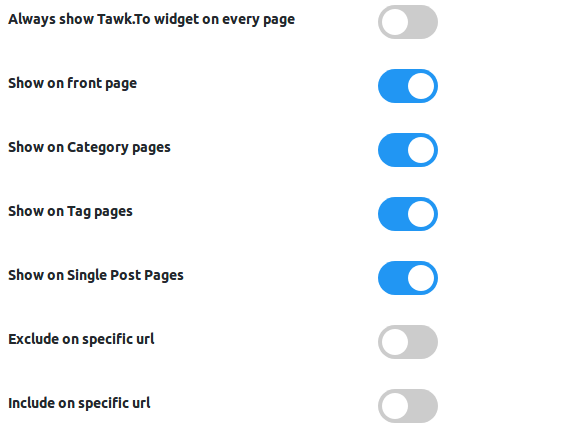 You can hide the widget for specific pages by turning on “Exclude on specific url” Turn the toggle off on “Always show Tawk.to widget on every page” and turn the toggle on for options that fits your need. NOTE: Turn the toggle off on “Always show Tawk.to widget on every page” and turn the toggle on for options that fits your need. You can make the widget appear only on specific URLs. NOTE: You would have to enter the full URL of the page you want to display the tawk.to widget. You could have several full URLs listed on the textbox provided. Do not forget to separate each entry with a comma. These settings could work with each other and you are not bound to select one option only to enable you to set the widget visibilty based on your needs. Always remember to save change you make. Click on one of the “Save Changes” button to save your configuration. For Woocommerce there are some additional Visibillty options. 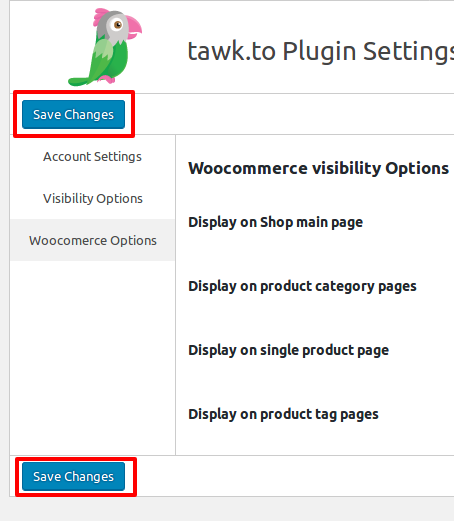 Click on Woocommerce Options to view the additional options. 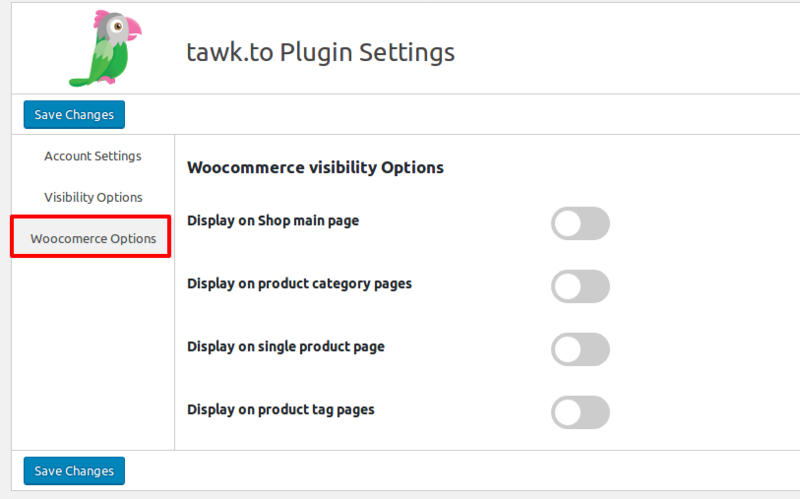 You can add tawk.to functionality to your site without installing the plugin. If you are using cloudflare for your wordpress site, you could also install widget using Cloudflare Apps. click here to know more about that process.